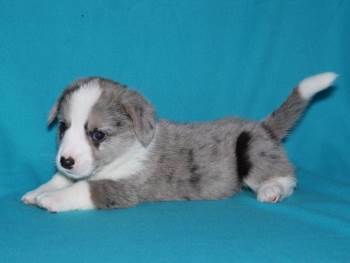 The Cardigan Welsh Corgi is a loving, loyal and even-tempered dog that does well with families, singles, and couples. Equally at home on the farm, in a suburban household, or in the city, these dogs excel in obedience, tracking, agility, rally, herding, or just being someone’s companion. They are alert and make excellent watch dogs. They tend to be wary of strangers and offer their affection only to those they love. These Corgis are on the large end of our definition of small dogs, but we have included them here because their low height makes them seem smaller than they really are. Their personality is similar to small dogs in so much as they think of themselves as a bigger dog than they really are. Not known as having high energy, these dogs are still quite active and need daily walks, romps in the yard and active play sessions. Beyond physical exercise, this breed needs to have a job to do, and they need mental exercise to keep them happy. 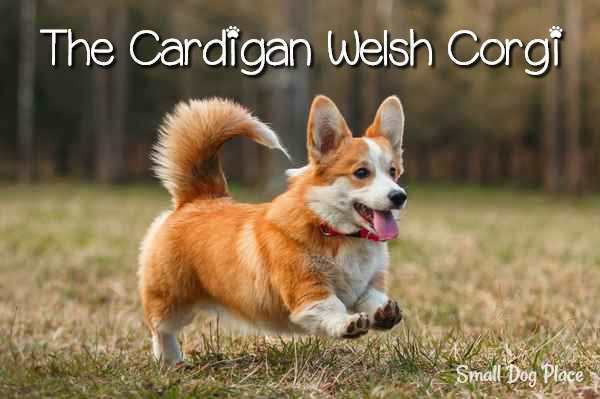 Cardigans are one of the two Corgi breeds that originated in Wales thousands of years ago. The other is the Pembrooke Welsh Corgi. People often mistake one for the other but there are obvious differences. One of the most obvious differences is the tail. Cardigans have long bushy tails and the tail on the Pembrooke is docked. Cardigan ears are also different—they are larger and slightly more rounded at the tips. Pembrooke Welsh Corgi ears resemble triangles. The Cardigan has a bigger, longer body and is a little taller at the shoulders. I will discuss more about differences under the History heading. 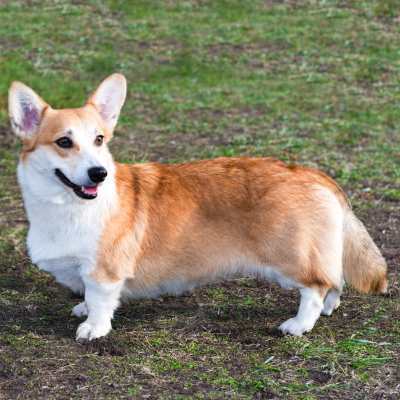 Pembroke Welsh Corgi: Notice the lack of a tail and the shape of the ear flaps. 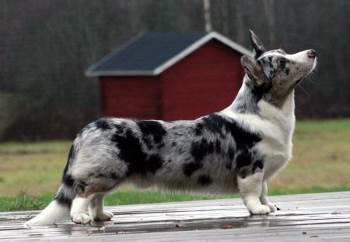 Cardigan Welsh Corgi: A Thick bushy tail and a slightly larger body will differentiate the Cardigan from the Pembroke. Colors: The AKC recognizes these colors: Tricolor (black, white and tan) Blue merles, Brindle, Sable, and Red; Most have white markings on their legs, chest, neck, stomach and tip of tail. Good with Children: Yes, especially older children; tend to ‘herd’ younger children. This is a long video that spotlights exemplary dogs in different categories. The Cardigan in the video was given the award for great companion dog. It is believed that Cardigans have been in existence in Wales for over 3000 years having first arrived by Celtic tribes who migrated from central Europe. The earliest forms of the breed was a form that included the Teckel Family of Dogs. The Teckel Family also includes the Dachshund and the Basset Hound. 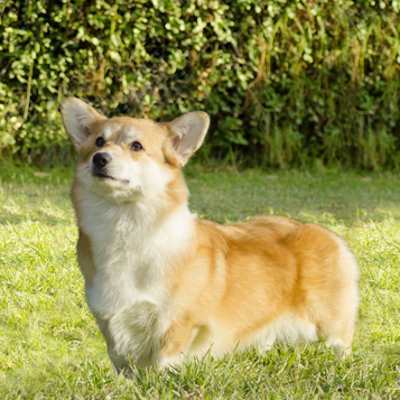 Found in the green hills of Cardiganshire, Wales, the name corgi is derived from cor meaning dwarf and gi for dog. They were developed to lead a herd of cattle, warding off potential predators and finding a place for good place for cows to graze. They are short and low to the ground which was an asset when dealing with cattle. If a cow decided to kick, the hoof of the cow flew right over their head, keeping these low to the ground dogs safe. It was not until later that the Cardi as they are often called, began herding and driving cattle from their farmlands in Wales to English marketplaces. Around 1000 years ago, Viking invaders introduced Spitz type dogs to Wales. Locals crossed the Spitz with some of the original Corgi dogs that eventually produced what is now known as the Pembrooke Welsh Corgi. All of the other dogs not bred with Spitz dogs retained their original bloodline and became the decedents of the modern day Cardigan Welsh Cargi. The late 1800s can be called the era of dog showing where wealthy individuals who fancied a specific breed would show their pets. The Corgis were shown at some livestock shows for heelers or curs, but it was not until the 1920s that the name Corgi came into regular use. In 1925, Corgis were exhibited at Kennel Club, in England but at that time there was not a differentiation between the Pembrookes and the Cardigans. As a result, both breeds were interbred. It was not until 1934 that they separated the two breeds. In America, the AKC first recognized the Cardigan Welsh Corgi in 1935. As of 2014, they rank 78th out of 178 registered breeds. Historically the Cardigan was developed to be a companion and farm helper/guardian which makes them an ideal candidate for an all-round good choice for a family dog. They are adaptable but beyond all, they want to be part of a family. Whether they live in the city or on the farm, they will be most happy when their family involves them in their daily lives. They love their people but may be reserved with strangers. They are intelligent, even tempered, and alert making them excellent watch dogs. An excellent watch dog is likely to bark at most anything, so consider this breed to be rather vocal. He is generally active and needs a good daily walk and/or romp in the yard. If developed athletically he can excel in a variety of canine sports. Like some other small herding dogs, these dogs may have a tendency to herd small children (nipping them on their lower legs or ankles) so to be safe, they do best with families with older children. They are highly intelligent and trainable, but do have a stubborn streak. Their desire to be with their humans can lead to separation anxiety if left alone for long periods of time. They get bored and will find something to do. Give them a job to do, keep them busy, both physically and mentally and they will be the happiest dog ever. Cardigans have a double coat that includes a short, thick undercoat and a long thick topcoat. They shed throughout the year but will shed more profusely during seasonal molts. Bushing will help keep shedding under control by removing dead hair. Daily brushing is most important during seasonal sheds. A bath will also help with shedding and keeping the coat clean but frequent bathing is not necessary. In addition to coat care, they will need to have their teeth brushed, ideally daily, but at least several times a week. Nails need to be trimmed about every three weeks. Some dogs can wear their nails down naturally if they walk on hard surfaces such as concrete. If the nails begin to “click” on tile or hard floors, it’s time to trim or grind them down. Ears should also be checked frequently and wiped down with a cotton ball dipped in an ear cleaner. If you notice redness, an odor, or dark discharge, it is time to call the vet. A quick once over each week will alert you to any problems your Cardigan might have. Check ears, mouth, skin, paws, foot pads, and nose for sores, rashes, redness, tenderness or any other signs of inflammation. Call your vet if you notice anything unusual. 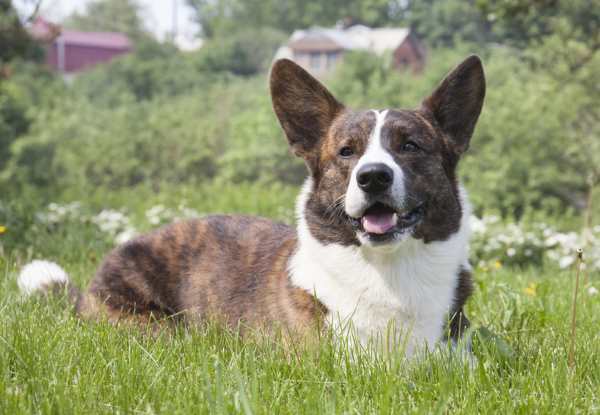 The Cardigan Welsh Corgi is considered to be a healthy breed, but just like all other dogs, they are prone to certain health concerns. Due to their long backs, spinal disk disease is a problem. A Cardigan that is showing signs of unsteady gait, difficulty going up or down the steps,weakness or even paralysis is likely suffering from a slipped or ruptured disc and needs immediate veterinary attention. Other problems that have been identified in the breed include eye problems such as cataracts, glaucoma and distichiasis, and displaced lens. Most Cardigans have excellent appetites and tend to enjoy their food a little too much. Obesity can be a problem in this breed, especially if over eating is paired with lack of exercise. Hip Dysplasia has also been identified in the breed as well as Epilepsy. Degenerative myelopathy, a disease that affects the spinal cord and causes a degeneration of nervous and supportive tissue along the spinal cord and back. A new DNA test is showing some promise in identifying the issue that will help veterinarians diagnose the disease. Cystinuria, an issue that causes high levels of cystine, a protein to be excreted in the urine. This causes stones to form and is a painful condition leading to other problems. Cystinuria typically only affects male dogs. Another problem that has been identified in this breed is Patent Ductus Arteriosus (PDA), a congenital problem that causes deoxygenated blood to bypass the lungs. It is usually detected in small puppies and can be fixed surgically. We recommend that you do enough research about a breed before you begin to look at breeders or adoption agencies. These books are worth checking out if you are interested in adding a Cardigan Welsh Corgi to your household. The books can be purchased directly from this site to Amazon and we receive a tiny commission for any items purchased from this site.